A quality catalogue of National Hunt Foals and Mares featured the Trull House Stud Dispersal alongside a host of other exciting Lots and these helped to ensure that the Sales Complex was full of buyers throughout the day and drive results to new heights following a record sale in 2017. Richard Kelvin-Hughes’ Trull House Stud Dispersal was a big draw card for the sale and the 26 fillies and mares lived up to the hype with buyers from throughout Europe ensuring a frenzied trade throughout. Topping the draft, and today’s final session, was Lot 378, a Fame And Glory 3YO out of Thomas Campbell producer, Hora. The filly was purchased by Michael Hyde for £130,000. Following in the Trull House Dispersal was Grade 2 winning mare, Chomba Womba (Lot 386) and Listed producing Hora (Lot 387), who sold to Highflyer Bloodstock for £80,000 and £95,000, respectively. Away from the Trull House Stud dispersal, the Listed winning, Grade 1 placed Aurore D’Estruval (Lot 391) also made a strong price when knocked down Bobby McCarthy with George Mullins signing the docket at £90,000. Topping today’s foals session was Lot 368, a filly by Darley Stallions Authorized, who was purchased by Stroud Coleman Bloodstock for £74,000 from the Trull House Dispersal, marking this as the highest priced 2017 National Hunt foal to sell at auction. Kayf Tara was also in high contention throughout the sale with Lot 215, a colt out of Grade 2 placed mare, Lifestyle, selling to Michael Haggas for £52,000. Other Foals to make significant prices on the day included a Martaline colt (Lot 202) offered by Goldford Stud and sold to Aiden Murphy for £48,000 whilst Harry Dutfield’s Shantou colt (Lot 306) sold to Henrietta Knight for the same price. 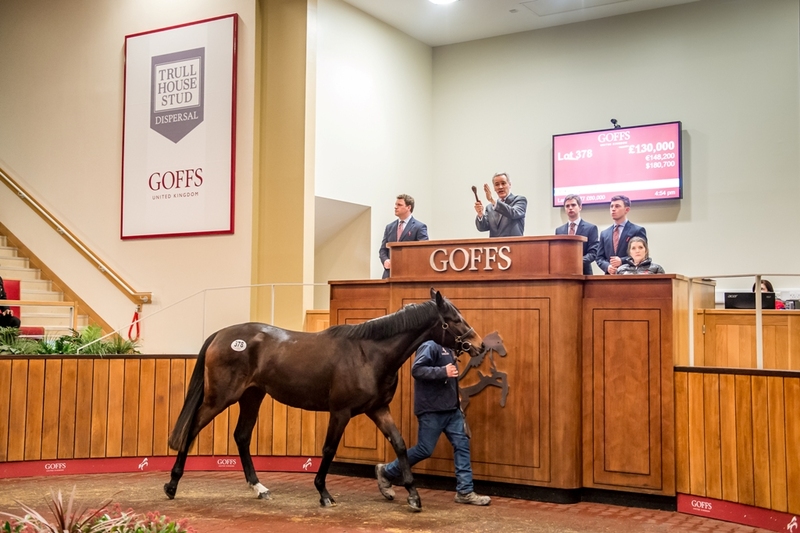 “It was always going to be a big task to follow the record sale of 2017 but the last two days have completely eclipsed those figures and returned significant rises across the board whilst also selling the highest priced NH Foal of 2017. The Trull House Dispersal was always going to be a highlight of the catalogue and it didn’t disappoint. With 8 of the top 10 prices on day 2 coming from this dispersal, we would like to thank Mr and Mrs Kelvin-Hughes for entrusting us with their wonderful Mares and Foals, many of whom where household names to racing fans. We look forward to following these Mares and Fillies with their new connections and will cherish the buzz that they helped to create in Doncaster today. But the success of the day was by no means restricted to one vendor and the days other highlights would have given cause for celebration without the addition of Trull House. £90,000 for a NH mare and £52,000 for the TBA NH Foal Show winner are results to be celebrated in any other year and we are indebted to all Vendors and Purchasers who have helped us to start 2018 in spectacular fashion.